In its opening chapter, Year Zero 's narrator tells us that among the teeming species of the galaxy humanity is unremarkable in every way, just another young species far more likely to self-destruct than to survive its climb up the technological ladder toward the intergalactic community. Unremarkable in every way, that is, except one: our music. Humanity's music, it turns out, is so much better than what anyone else has ever done that even a hokey TV theme song can cause aliens to die of sheer joy. In the decades since our early space probes caused some alien anthropologists to investigate our culture, aliens have been happily obsessing over our music while enforcing a sort of Prime Directive that prevents us from knowing they exist. But there's a problem. According to long-established custom, young species' pre-contact property laws must be respected, and alien anthropologists have just realized they have been pirating Earth music. Galaxies worth of aliens have made trillions of copies of our songs, and under the terms of American copyright law the penalties will be utterly catastrophic for the universe's economy. Given the excesses of straight-faced science fiction it's probably necessary to say outright at this point that no, this is not a serious speculative premise, and indeed this is not a serious novel. Year Zero is out to make the reader laugh, and its primary weapon is the inherent absurdity of an otherwise completely superior alien civilization that simply can't get enough of Olivia Newton John and Ozzy Osbourne. From this comedic foundation Year Zero carries out a surprisingly thorough worldbuilding project. If there are countless billions of alien fans of The Who, all of whom have access to faster-than-light transport, how do you keep them from overrunning the Earth? What happens if there's an immense market for live performances of human music but no human musicians available to perform? What will aliens with incomparably advanced dramatic arts make of reality television? If nothing else, answering questions like these situates Year Zero far from the perhaps exhausted tropes of mainstream science fiction, and although it has been written to be accessible to those who haven't read widely in genre, longtime genre readers will get more out of it, because they recognize the speculative moves Reid uses to connect his ridiculous premise to his even more ridiculous outcomes. Lurking beneath all this absurdity is a serious point about copyright law. The narrator, a young lawyer named Nick Carter, is secretly (and illegally) contacted by aliens because he works for an elite copyright litigation firm. And also because he has the same name as a Backstreet Boy, so they thought he was an, ahem, expert musician in addition to being a lawyer. Because the aliens set up a facility in the United States to copy the world's music, their infringement is subject to American penalties (up to $150,000 per song) and, because of an international reciprocity agreement called the Berne Convention, these penalties apply to virtually all the music humans produce regardless of what country they're from. The point Year Zero wants to make, albeit while being as amusing as it can, is that these real laws produce effects so absurd they don't seem at all out of place in the rest of the novel. When it comes to copyright law, the author, Rob Reid, has an ax to grind. He was the founder and CEO of Listen.com, the company that created the Rhapsody online music streaming service in 2001 (full disclosure: the service still exists today and I am a subscriber). Reid sold the company to Real Networks in 2003, but not before lengthy rights negotiations with the major labels had given him what turns out to have been a lasting distaste for American copyright law and the ecosystem of lawyers, politicians, and corporations who benefit from it. This is probably familiar ground for many readers, who have probably heard at least a little about this from people like Cory Doctorow. As a former CEO Reid has a different perspective than Doctorow, but it primarily amounts to tone. The protagonist of Doctorow's Little Brother (2008), for instance, is a plucky victim of the security laws that novel criticizes, one who finds a way to become a force for change. Year Zero 's protagonist wants to join the system, not fight it, and has been trying to get his foot in the door of one of the parasitic law firms the novel is satirizing. Reluctantly assuming the role of good guy due to circumstance, his instinct (informed, one can't help but imagine, by the author's own experiences) is to assume there's no hope of reforming the system and instead to deal with the immediate crisis by finding a way for the copyright-leniency faction to hire the nastiest lawyers. All of this could easily become tiresome, but although Year Zero effectively demonstrates the absurdity of the penalties in modern copyright law, it avoids the temptation to preach its message directly. In a longer story he might become grating, but Year Zero doesn't overstay its welcome. And a good thing too: any time the pace of humor and invention starts to flag, the book's failings can become distracting. The worst of these is the depth of the characters, or rather the lack thereof. Even though there is a relatively small cast, none of them ever amount to more than simple types: the cynical narrator, the generic love interest, the sleazy relative, the scheming villain, the incompetent minion, and so forth. The plot as a whole, which sees Nick and his female neighbor drafted into a planet-hopping effort to thwart the plans of a malicious alien faction, is more disciplined than humor or parody stories often are, but is still not nearly interesting enough to sustain the novel on its own. "It's a superheavy element that your scientists haven't encountered yet," Özzӱ squawked. "You'd probably call it something stupid like unseptiquadrium. But we call it metallicam. Because it's the heaviest metal that can possibly exist in this universe."
. . . "As in . . . the band?" "I was disappointed too," Özzӱ said, making a shrugging gesture. "I was hoping for ironmaidium. But back when we renamed it, the votes were with Lars and the boys."
. . . "What about bonjovium?" I asked. I've always had a weakness for "You Give Love a Bad Name." Reid keeps the pace fast throughout, so if anything falls flat (as jokes inevitably must when there is a novel full of them) the narrative dusts itself off and keeps going. That Özzӱ scene is littered with references to heavy metal music, but after a few pages the story's moved on to making fun of how its bachelor narrator never cooks his meals, then to technology jokes as he and his neighbor try to understand the user interface of one of Özzӱ's tools. Any science fiction novel with the temerity to try to be funny gets compared to Douglas Adams whether doing so makes sense or not, and Year Zero sticks its neck out by making its antagonists want to resolve the question of penalties by destroying Earth and everyone on it. There's also a discussion of fame as an elemental force in the universe that recalls Adams's games of perceptual physics like the Somebody Else's Problem field. But apart from these occasional echoes, Year Zero 's reliance on a consistently built world and structured plot gives it a very different flavor from Adams's freewheeling aburdism. A better (and more timely) comparison is Ernest Cline's 2011 novel Ready Player One . Just as Cline's novel waxed nostalgic for 1980s American pop culture, Year Zero is a celebration of the last fifty years of Anglo-American popular music. Both novels build a by-the-numbers adventure on their improbable premises and an unconvincing romantic relationship for the protagonist. Neither is particularly compelling in terms of its raw fictional material, but because Reid's novel doesn't ask the reader to take its protagonist or its worldbuilding seriously, it's much easier to go along for the ride and enjoy it for what it is. And where Ready Player One asked us to empathize with a protagonist who wants nothing more out of life than to be the best '80s trivia buff he can be, Year Zero relegates the all-consuming obsession with music to its alien characters and makes it all part of the joke. But if Rob Reid is not obsessed with music, his love for it still comes through on the page, and readers who are big enough fans of classic rock or current pop music to get the references he makes will enjoy the book the most. Reid even includes massive playlists themed around each of the novel's major characters at the end of the book. Most of the humor, however, is broad enough to be accessible even to those who, like me, aren't familiar enough with the relevant artists and songs to play the reference game. 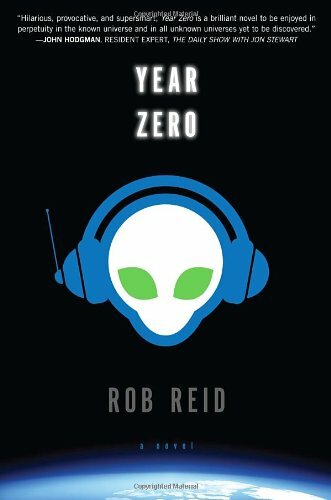 Those who like their fiction serious should look elsewhere, as should those who can't abide poor characterization, but readers willing to overlook some flaws in an amusing narrative of aliens and music will find Year Zero puts on an enjoyable performance.